This unique workout combines the elements of Pilates, yoga, resistance training and ballet into a highly effective regime performed on the mat and at a ballet barre. The technique utilises the body’s own resistance in conjunction with weights, bands and small balls. The effect is a long, lean dancers body without being a dancer! Stretches are performed after each strength section of the class to ensure the muscles are re-lengthened to create a body that is strong without the added bulk of other regimes. This workout is suitable for everybody as various modifications are given throughout the class to suit the abilities of all students. *Classes run school term time only please check dates with Rebecca. 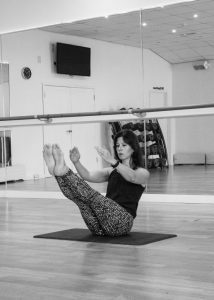 I qualified as a Pilates instructor in 2005, I am an accredited member of body control Pilates, and a REPS Level 4 instructor. In addition to group classes for the general public I am able to offer private lessons to clients who wish to enhance their athletic performance or those who have specific conditions that would benefit from a one to one approach. I am also qualified as a specialist instructor for low back pain. Body control Pilates is suitable for everyone, whatever your fitness level, age or gender. Pilates is slow, controlled and precise method of exercise which combines elements of yoga, ballet, martial arts and gymnastics. Sometimes, due to poor posture, the muscles around certain joints in the body, in particular the shoulders and hips, can become weak, or too tight. This can mean that the joint is not as stable as it should be, or that the way that the bones articulate within the joint is unbalanced. Pilates focuses on exercising the muscles that are responsible for keeping our joints stable and well aligned. By working these deep postural muscles while maintaining correct postural alignment, we can help strengthen the muscles that stabilise the joints. This can, in turn, reduce the level of wear and tear that joint receives and help to protect the joints from injury. Pilates will help you to become more aware of your own posture and how to work towards improving it, both during your activities of daily living, or your regular sports. To enquire more please email Rebecca or call 07734 934751. Please ensure you book your course early as we allow a maximum of 12 in a class. Prices £10 per session bookable in blocks of 6 or £12 on the day. One to One sessions also available.